Photoxels have reviewed the Panasonic Lumix DMC-TZ5 a 9.1 megapixel (CCD) digital camera with 10x optical zoom (28mm – 280mm), 3.0 inch LCD with 460,000 pixel resolution and 20 megabytes of internal memory. This entry was posted in Digital Cameras, Panasonic and tagged Panasonic, Panasonic Lumix, Panasonic Lumix TZ5 on May 24, 2008 by jonathanb. PopPhoto have reviewed the Panasonic Lumix DMC-TZ5 a 9.1 megapixel (CCD) digital camera with 10x optical zoom (28mm – 280mm), 3.0 inch LCD with 460,000 pixel resolution and 20 megabytes of internal memory. This entry was posted in Digital Cameras, Panasonic and tagged Panasonic, Panasonic Lumix, Panasonic Lumix TZ5 on May 4, 2008 by jonathanb. DP Review have just posted their concise review of the Panasonic Lumix DMC TZ5, a 9.1 megapixel (CCD) digital camera with 10x optical zoom (28mm – 280mm), 3.0 inch LCD with 460,000 pixel resolution and 20 megabytes of internal memory. This entry was posted in Digital Cameras, Panasonic and tagged Panasonic, Panasonic Lumix, Panasonic Lumix TZ5 on April 23, 2008 by jonathanb. The Panasonic Lumix DMC-TZ50 is a new 9.0 megapixel compact digital camera featuring a 28mm wide angle lens with 10x optical zoom (28 – 280mm equivalent), 3.0 inch LCD screen with 460,000 dot resolution, HD video recording capability and built in Wi-Fi capability. 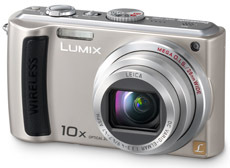 The Panasonic LUMIX DMC-TZ50 will be available in silver in May 2008 for around $449. This entry was posted in Digital Cameras, Panasonic and tagged Panasonic, Panasonic Lumix on April 17, 2008 by jonathanb. The Panasonic Lumix DMC-FX35, known in Asia as the Panasonic Lumix DMC-FX36 (announced 29 January 2008) is a 10.1 megapixel (CCD) camera with a 4x optical zoom lens (25mm – 100 equivalent). The Lumix DMC-FX35 features a 2.5 inch LCD (230,000 pixels), 50 megabytes of internal memory, digital red eye correction, intelligent ISO, intelligent scene selector, face detection and comes in silver, black and blue. The LUMIX FX35 is also capable of recording 720p High Definition motion pictures and 1920 x 1080 pixel High Definition-ready photos that perfectly fit a wide-screen (16:9) HDTV. The Panasonic Lumix FS5 (announced 29 January 2008) is a 10.1 megapixel camera with a Leica DC Vario-Elmarit branded f3.3 – f5.8 4x optical zoom (equivalent of 30mm – 120mm). The Panasonic Lumix FS5 features a 2.5 inch LCD with 230,000 pixels, 50 megabytes of internal memory and comes with Intelligent ISO, intelligent scene selector, quick auto focus (for focussing without having to push down the shutter half way) and has face detection technology. The Panasonic Lumix FS5 is available in Red, Black and Silver.